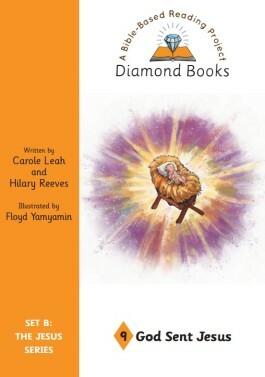 The second series of books in the Diamond Books Bible based reading project is ‘The Jesus Series’. This series consists of 16 books for 4-5 year olds to read themselves. Books 1-8 (Part 1) focus on what Jesus said about himself, shown in John’s gospel. Books 8-16 (Part 2) tell what Jesus came to do, based on Isaiah 61:1-2 and Luke 4:16-21. Each book teaches about one of the names given to Jesus in the Bible. For example the first book teaches that Jesus is the light of the world. Adults can help a child to orally memorise the Bible verse and its reference, and use a replica diamond to explain that, just as a diamond has many sides, so God has many names to show what He is like. The alphabet’s first eight letter sounds are introduced, and reinforced through a variety of activities, in Books 1-8 (one per book). For example the first book majors on ‘A’ and ‘a’ letters, offering help with writing the letters, giving suggested activities, reading tips, charts to aid recall, and words that children need to read the book. The Jesus Series has been written by Carole Leah and illustrated by Floyd Yamyamin and is being published by Westbow Press in Spring 2017.